Windows 10 devices on these chips can be expected later this year. 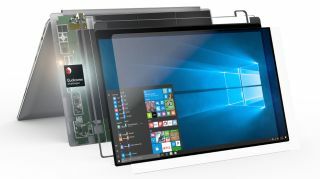 Qualcomm has a new Snapdragon processor for the growing market of always-on Windows 10 PCs. The Qualcomm Snapdragon 850 Mobile Compute Platform, developed with Samsung, aims to blur the lines between PCs and mobile devices even further. Future PCs will stay connected to LTE or Wi-Fi at all time, so that users can get notified and have their data always, regardless of where they are. But the biggest roadblock to that idea was power efficiency. The new device is engineered to support up to 30 per cent system-wide increase in performance, and up to 3X AI performance, compared to the previous generation, the Snapdragon 835. Then, there’s the 1.2 gigabits per second LTE connectivity speeds, as well as up to 25 hours of continuous usage. Future computers running this chip should be sleeker, more portable, quieter (fanless).